In Filemyr’s imaginative recreations of love, love is transformed into a wild, ever-present entity animating the hidden and the inorganic, as well as magic-filled moments nearly missed. It’s a linguistic feat to stretch the word love in the ways Filemyr does, as only a poet can and must, and wholly necessary due to “the great red muscle,” “under the curved rib bone,” straining against the restrictions of the English language which is so very much unlike Sanskrit (which boasts ninety-six words for love), or Persian (which contains eighty), or even Greek (with three). Love with all of its histories and intricacies, has become just another four-letter word. Written in free verse, these prose poems in Filemyr’s fifth book engage stanzas as scenes. “Scrapwood starched by the sun ignites easily./We sit beside the solstice fire. You pick/the stiff hair of your guitar. I read poety./What could be more lonely/than the moon/surrounded by an ice halo,/or the tired faces of our mothers?” Many of the poems are complete with characters who undergo change, including Filemyr herself. Poems that even wander at times further into the territory of fiction, borrowing such elements as plot and place. 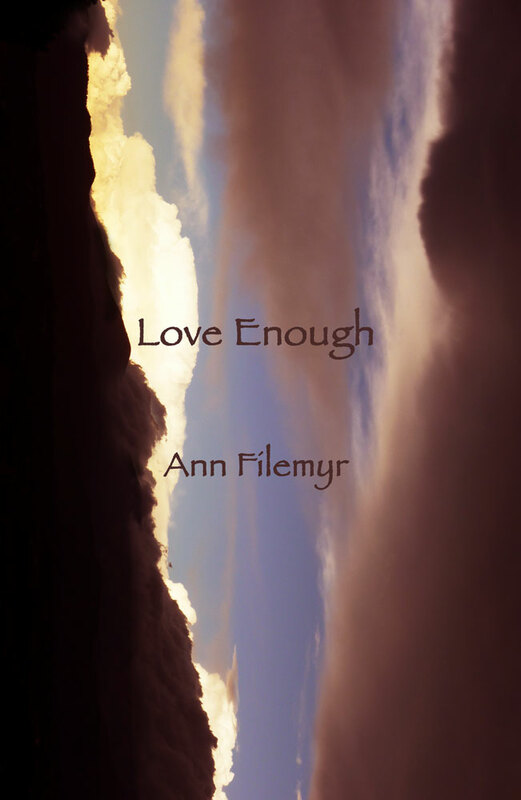 “Love Enough” is a lyrical catalogue of memories enduring death and violence, tormented by racism and homophobia, where still, in the midst of a world that wants to wage war against them and their love, sweetness survives and thrives. Love is fortified every single day. Repetition of language is used to spiral in and with each refrain creates intimacy. It is that simple and yet it is never that simple. Jamie Figueroa is pursuing an MFA in Creative Writing from the Institute of American Indian Arts. Her work has been published in various literary journals including Split Oak Press, The Santa Fe Literary Review, The Yellow Medicine Review, Flash: International, ekleksographia and Sin Fronteras. Jamie teaches creative writing at New Mexico School for the Arts. She is a recipient of the Truman Capote Scholarship as well as the Jack Kent Cooke graduate scholar award. The Dailiness is a door through which we enter and find a world where the mundane transcends and becomes magic. Neatly separated into three sections, the poems in this collection unfold from Camp’s present life to detailed moments of years past. Familial relationships, modes of transport, the high desert landscape where Camp lives and cities far beyond are all gathered into stanzas that wander across the page in experimental forms, as well as stanzas that are stitched together in more traditional forms. 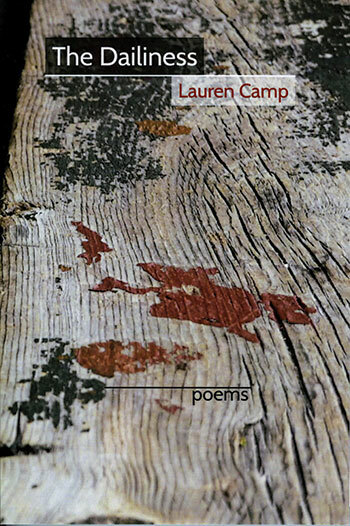 Camp brings all of herself to the page in her newest book of poems. Years spent as a fabric artist are evident in the ways she experiences the world and translates this complex, multi-layered form into a one-dimensional plane. Indication of this is found in “For Those of You,” where hope is crinkled, night is flannel, and “she wove us into words,/her voice twined with wine…” As well as in “Ten Years,” where pain threads, days scratch and tongues unravel. Yellow knits and wind weaves in “A Form of Light” and in “Dream Pantoum” life is a cuff and your mind is a tiny sock. It’s because of these splendid juxtapositions that the reader is able to brush up against the texture of an encapsulated moment and feel the variations of reality from one memory to the next, from one moment to the next and from one day to the next. Camp’s love of jazz is also clearly a point of inspiration for these poems. If she were to play an instrument in this collection it would undoubtedly be the letter “s.” Her use of alliteration sounds bold with “s” and imbues musical delight. As heard in “In Provincetown,” where rhythm is strong and the musicality of her choice swings on its use, “talking stripes of light,/sucking sound of rubber boot/on saturated shore,/dug-up slurp of quahogs from sand.” More “s” slips though in “Thelonious Monk On A Subway,” “Fixed Gaze of Winter” and others. Her use of repetition and line breaks also stimulate the sensation of music. Another great example of Camp’s attuned ear can be heard in “At Echo Canyon” where the iteration of the word rock (over 70 times) functions as a downbeat both calling attention to itself and disappearing simultaneously. The Dailiness begins with a poem entitled, “Looking Around These Days,” where tiny ants march through the landscape of the poem on several different occasions. These ants haunt by the final section where night and moon, sleeplessness, desire and stillness are echoed in a kind of diligence akin to the ant. A presence that while seemingly small, but because of the strength in its multiplicity, can move ground, shift earth and disrupt blind habits. This is mirrored in the measurement of living this collection provides. A daily dose of longing, regret, desire, and memory when spooned in small increments, as in the episode of one single day, becomes a reduction where routine muffles vitality. When each of these single days is compiled into the force of years, of a life, the dosage becomes monumental and the earth shifts. In this way, each poem converts into a breath serving as the tenuous reminder of impermanence and the necessity of witnessing the detailed moments of our lives. Camp’s ability to conjure curiosity in her reader through the seduction of what is familiar casts a spell. When read aloud, especially, the call is impossible to resist. Go willingly. Become unraveled.